This piece is part of a series of exclusive interviews The 74 conducted in partnership with Chiefs for Change to recognize National School Choice Week. Click through to read our conversations with Tom Boasberg, superintendent of Denver Public Schools, and Lewis Ferebee, superintendent of Indianapolis Public Schools. 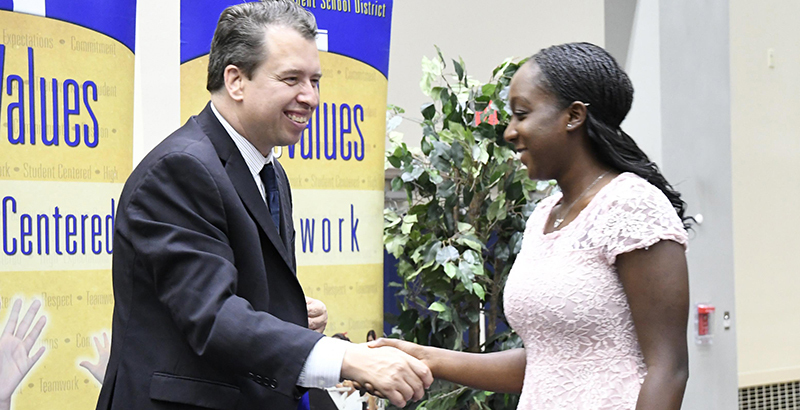 When Pedro Martinez arrived in San Antonio to lead the Independent School District in 2015, he was handed a portfolio of just two quality schools of choice and carried with him a goal of improving academic achievement and creating equity in one of the most economically segregated cities in the country. Martinez brought with him experience from Washoe County School District in Nevada and Chicago Public Schools. He grew up in poverty in Chicago’s inner city after his family emigrated from Mexico when he was 5 years old. Martinez was the first in his family to graduate from both high school and college, paving the way for his siblings to follow his lead in earning their own degrees. Three of his sisters eventually became teachers in Chicago Public Schools. The following interview has been lightly edited for clarity. The 74: What do you consider your biggest accomplishment in offering a high-quality education to families? I came in 2 1/2 years ago, and we had a couple high-quality options open, but there wasn’t much else. Since then, we’ve opened up an all-boys school and we have options for Montessori and dual language. Texas allows districts to enroll from anywhere within our region, so we have a free market of sorts. And we’ve seen a strong demand for our options even from outside our district. And seeing the overwhelmingly positive response of families both within and outside district boundaries — that we’ve instilled that type of trust and excitement in families is perhaps the biggest accomplishment that I see. In what areas, and from where, do you face the most backlash? We haven’t seen backlash up to this point on our current options that are open today. The most recent backlash, though, was this week when were bringing in a new high-quality option with New York’s Democracy Prep Public Schools. Our trustees and I went to see it in New York, and we loved their rigor and track record. But for the first time I did see some backlash from our unions because this would be the first traditional K-12 option in our district that will not have employees reporting to us — instead reporting to another organization — and not have the same type of contracts our teachers have. For every other option, the employees have reported to us, so we’ve been able to open new models with little resistance. Is it coming from parents? The short answer is “no.” I had a parent meeting last week to explain this, and it’s not coming from them. I’m proud of the trust we have built with parents. Parents want these choices. The backlash is coming from our unions and alliances in San Antonio. It’s about having charter schools that don’t have union contracts versus schools with union contracts or union right. But what I’m paying attention to the most is that we’re listening to parents and that for our employees, we’re partnering with individuals that are going to treat them well. Are your greatest challenges political or logistical? They’re mostly logistical. Different partners have different expertise in areas like English language learning versus bilingual education. The partners that we have have a deep commitment to working through those things, but it takes a lot of work and time. The political side is now revealing itself with the partnerships we’re entering. That’s something that I knew eventually was going to come, and it’s purely a political difference. I respect the union and their views. I don’t agree with them, but what I’m going to focus on is the needs of our students and doing what’s best for them. Where is there room for improvement? We’re learning. This is going to be a continuous process of learning. I look at the work that Denver, Chicago have done. The work has always been messy. Many times there’s philosophical differences and challenges around communication. There are many innovative models, so we need to understand what we’re doing and why we’re doing it. We need to make sure that we communicate effectively, answer questions, and stay positive because things can get negative. My hope is that we continue to focus on what’s important: listening to our families and responding to them. And we’re getting a very positive response. What role does a district superintendent have in promoting a portfolio of high-quality options? Here in San Antonio it’s interesting because we were the original district in the city, and the city was able to annex 16 to 18 districts that have some presence within the city of San Antonio. So we have the opportunity to be unrestricted in how we enroll children. But while it really is a true free market, for lack of a better term, there are other unintended consequences. The main thing we have to ensure is that we don’t create inequities in that process. It’s easy for us to attract motivated, more educated families for these options. So if we’re not careful, we can design a system that weeds out a lot of families either because they’re working two jobs or don’t become informed of those options. In my role as a superintendent, I need to ensure we’re creating equity and serving families in these options that I know we may have to go the extra step to ensure they have access to them. How has your own thinking evolved on school choice over the years? This focus on equity is one that, from my experiences in Chicago and Atlanta, is a much higher priority for me. When I was in Chicago, we created some amazing magnet options, and to this day they’re still some of the top schools in the state. But one of the things I learned from that is that the unintended consequence was that while we brought back middle-class families — because we were losing them to the suburbs — we also reduced access to some of the neediest families because the demand was so high for those seats. The same thing is seen in Boston with their Latin schools. You end up creating, by mistake, a segregated system. We are already the most segregated city by income in the country. So our challenge here was: As these schools become very popular, how do we prioritize those seats to ensure that families that may not be as well informed will have available to them? It’s about having a stronger focus on equity and access, and that’s something that has evolved, because I was proud of the work we did in Chicago, but I have the ability now to reflect on: For all the successes we had there, what were some of the challenges we created? What are some lessons learned from your experience that can be extrapolated and replicated in other states and districts? We always have to think about choice in a very broad way. One mistake is, when we talk about choice, it brings out certain terms: charters, vouchers, magnet programs. I’ve worked in K-12 across four cities across the country, and the local context matters a lot. What’s right for one community might not be right in another. How do you build on the assets you have? That will build the quality of success. How do I deal with the fact that it’s already a very segregated city? One of the things I did my first year was listen and evaluate the community, and we were very careful about the options we rolled out. Now we know more. That’s one of the reasons I think families are willing to trust us, because we’re being thoughtful about it, it’s something that’s specific to San Antonio, and if I were in New York City, I’d want something that’s specific to that site. One of the things that grounds me is that as I talk to our staff and community, the one thing I make clear is: Regardless of the partnerships and the options, they’re different pathways, but they all have to go in the same direction. Children have to graduate and, if they choose, go to university and graduate. And we have to match them with the right universities. Having that clear north star is very important. Everything until then can be a different pathway to get there. As long as they get there.